Kaivac, maker of OmniFlex floor cleaning systems, recently launched its "Stop the Mop Campaign," which includes a new website, StoptheMop.com. The campaign and website are designed to educate building managers and the professional cleaning industry how using mops to clean floors can be one of the most unhygienic ways to maintain these surfaces. 5. 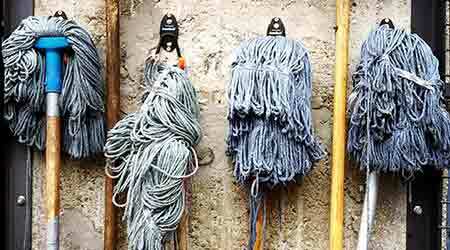 Within a week, a mop can grow a bacterial population of millions. How often have you reused a mop that has soaked in a bucket? "And, there are many other setbacks and issues that cleaning professionals should know about using mops to clean floors, including that it is a cumbersome, time-consuming process," adds Matt Morrison, communications manager for Kaivac. "Mopping is slow, stressful, fatiguing, and, as we know, just does not work all that well."